When I was 10 I wanted to be a paleontologist. I work as an Independent Designer in Digital Games & Art. 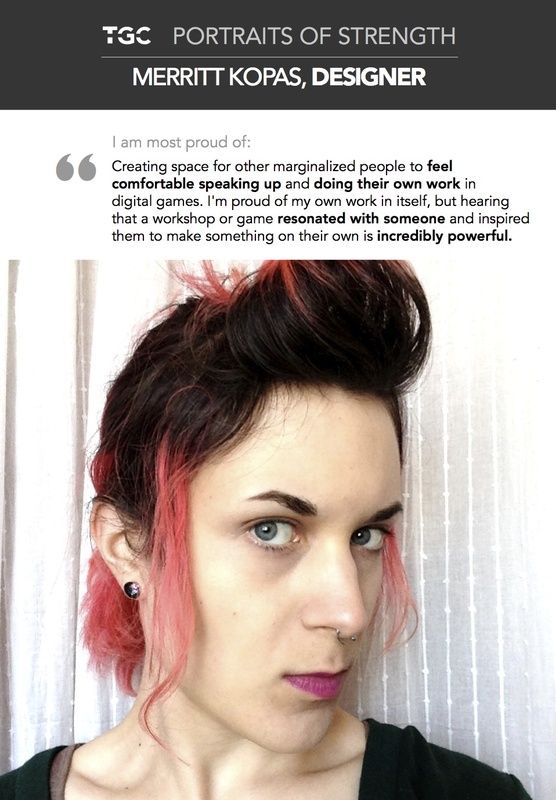 I am proud of creating space for other marginalized people to feel comfortable speaking up and doing their own work in digital games. I’m proud of my own work in itself, but hearing that a workshop or game resonated with someone and inspired them to make something of their own is incredibly powerful. The biggest obstacle I have faced is poverty and material insecurity. I’m lucky to have a supportive community, but we need to fight against the toxic myth that adversity is the source of interesting work. My advice to women is find mentors and support networks online or in person, and make connections with people who don’t work in games. Recognize that oppression is multidimensional and make an effort to build coalitions and spaces with people outside of your experience, especially if you are white, cisgender, straight, etc.